UTA 772 bombings that were blamed on Libya were obviously wrong according to MEBO! The Open Letter to Capitol Hill asking for help to stop the US deal on Libya for the Victims of UTA flight 772 was unsuccessful. Once President Bush signed the "Libyan Claims Resolution Act" on August 4, 2008, the UTA-772 claim by law firm Crowell & Moring LLP (US$ 6 billion) against Libya was eliminated and our investigation in the UTA-772 case on this webpage became history. UTA Flight 772 tragedy on the 19th of September 1989 over the African desert is the second conspiracy against the state of Libya after the PanAm 103 tragedy over Lockerbie. On 19th September 1989, at 12:59 p.m. all contact with flight UT 772 was lost. The UTA Airliner DC-10 making the Brazzaville--N`Djamena--Paris connection had departed the Chadian capital at 12:18 p.m. and was flying over the Tenere desert (Niger) at an alitude of 35`000 feet when contact was broken. The aircraft was carrying 156 passengers and 14 crew members on bord, including Bonnie Pugh, wife of the American ambassador to Chad. 7 Americans died. Other passengers originated from Europe and Africa. 54 French, 48 nationals of Rép. of Congo, 25 Chadians, 9 Italians, 7 Americans, 5 Cameronians, 4 Britains, 3 nationals of Rép. Dém. of Congo, 3 Canadians, 2 Central Africans, 2 Malays, *2 Swiss, 1 Algerian, 1 Bolivian, 1 Belgian, 1 Greek, 1 Morrocan and 1 Senegalese. With the approval of the Niger authorities, enginneers from the French Central Police Prefecture Laboratoire were sent to the site to participate in the investigation, as well as specialists from the General Civil Aviation Office. The initial findings indicated that the DC-10 appeared to have suffered an explosion in flight, resulting in the deaths of the 170 people traveling on board the aircraft. Among the aircraft debries found at the site on 22th September 1989, by technicians from the General Civil Aviation Office were the two "black box" that flight 772 had been carrying from Paris. Initial analysis of the Data- and Voice Recorders did not appear to show any technical problems as the source of the catastrophe, and conversations inside the cockpit raised no similar suspicions. An anonymous caller to the news agency in London who said Islamic Jihad was responsible for the plane's downing, demanded the release of leader Sheik Abdul-Karim Obeid, who was kidnapped from southern Lebanon on 28th July 1989 by Israeli forces. Three days after he was kidnapped, the Organization of the Oppressed on Earth claimed it retaliated by hanging U.S. Marine Lt. Col. William R. Higgins, who was abducted while on U.N. duty in Lebanon. Doubt has been cast on claims Higgins was hanged at that time. Also UTA said it received an anonymous telephone call about midnight Tuesday, before the downed aircraft had been located by a French military plane, saying Islamic Jihad was responsible. The company said it had no way to judge the call's authenticity. Suddenly Investigators claimed to have found amongst the debris a small piece of green colored printed circuit, similar as in the Lockerbie-Affair, after French paratroopers had scoured the desert for several thousand pieces of debris, which were scattered over 50 square miles. But where did this tiny circuit board fragment come from? FBI expert Thomas James Thurman who was involved in the French experts investigation, concentrated his attention again on the printed circuit that triggered the bomb, because it seemed to have identical distortions as the timer allegedly used for the bombing of Pan Am 103 over Lockerbie. In both cases a tiny fragment of a circuit print was found, -- what an accident --, and in both cases this green colored tiny fragments were linked to Libya by criminal manipulations! As we will see later Thurmans's lab was already in possession of such timers. In the meantime Thomas Thurman was suspended from the FBI after his laboratory had falsified forensic evidence in various cases. In 1999, six Libyans were put on trial in the Paris Assize Court for the bombing of UTA Flight 772, were tried in absentia and were convicted. In 2003 the Gadafi Foundation in Geneva - not the State of Libya - paid compensation to the descendants of the victims under explicit objection that the state of Libya had absolutely nothing to do with this terror act and could therefore not be made responsible for eventually commited crimes by any of its citizens not acting on governmental instructions. In the world press this objection was never mentioned and its widely accepted that Libya's paying compensation is equivalent to a confession. That is absolutely wrong and an infamous lie of the worlds' leading news agencies against Libya by quoting only half of the truth! The reason why Libya accepted to pay compensation was because of the devastating embargo against Libya since 1993, provisionally lifted 1999 after the delivery of two Libyan Officials accused for the Lockerbie bombing to a court in the Netherlands (Camp Zeist), and defintitely lifted (2003) after Libya's enforced paying compensation for the descendants of the victims of UTA-772 (35 million US$) and PanAm-103 (US$ 2.7 billion). The economical damage for Libya because of this unjustly imposed embargo amounts to a minimum of US$ 40 billion. Initial speculations who might be responsible for he crash of UTA Flight 772 (1989) centered soon upon the "Secret Chadian Resistance" which was eager to claim responsibility for the attack; what was firmly opposed by president Hissene Habré. On 19th September 2006, the Paris court was asked to rule that the Libyan government and six of its agents were guilty of the 19th September 1989 destruction of UTA Flight 772. Damages of more than US$ 2 billion were claimed for the loss of life and the destruction of the DC-10 jet. The next appeal termin in the Lockerbie-Case is on the 20th of February 2008. Investigators traced the circuit back to a Taiwanese manufacturer. A German company (Grasslin) had ordered several electroplates of the same printed circuit board, which were used for counters. 1989 HP Marketing Company purchased 100 delay models of the printed circuit from Grasslin and delivered these on the 26th of July 1989 to Libya. During 1989 an agent (counterman) from a foreign Intelligence Sevice had purposely involved the Libyan Security organization (LESA) into the "TY"- timer business with the HP marketing company. Similar as in the Lockerbie-Affair a fragment of these circuit components was allegedly found at the spot of the wreckage of flight UTA 772. But these 100 pieces of "TY"- timer from Taiwan supplied to Libya have absolutely nothing to do with the UTA 772 crash! And there was absolutely no motif for Libya to commit such an atrocity. Notabene: Libya's "Toyota War" with Chad had already ended in September 1987. Annotation: Documents under crypto ENCODE are at this moment only accessable for law enforcement agencies. On March 10th 1984, an IED destroyed another UTA aircraft from Brazzaville shortly after the DC-8 had landed at N'Djamena airport. There were no fatalities on that occasion and those responsible were never identified. From Wikipedia: Iran Air Flight 655, was a civilian airliner shot down by US missile cruiser USS Vincennes on July 3th 1988. Compensation by US$ 61.8 million of the claim compensation for the 248 Iranians killed in the shootdown ($ 300,000 per wage-earning victim, US$ 150,000 per non-wage-earner). We should never forget that conspiracies are not theories but crimes. The most significant investigation revealed how the FBI conspired to incriminate Libya for the sabotage of both, Panam Flight PA-103 and UTA Flight UT-772. It was published in March 2001, just after the PanAm Flight 103 bombing trial (at Kamp van Zeist) had ended with the conviction of Libyan Abdelbaset Al Megrahi on the strength of just one piece of a alleged hard evidence; a tiny of green coloured fragment of a timing device, manufactured by the Swiss firm MEBO Ltd.
Two years earlier, six Libyans were tried in absentia and convicted in 1999 by a Paris court for UTA Flight 772 bombing. "It is striking to witness the similarity of the FBI-discoveries concerning the scientific proofs of the two sabotaged aircrafts, PanAm Boeing 747 (US) and UTA DC-10 (FR). Among the thousands or rather tens of thousands of pieces of debris collected near the crash sites, just one PC-board fragment was found in each case, witch carried enough information to allow its identification: MEBO for the Boeing 747 and "TY" (from Taiwan) for the DC-10. Both timer-fragments, the MEBO MST-13 PC-board and the TY-MING-YONG/GRASSLIN timer-fragment were never investigated by traces of explosives residue, and could not therefore have been connected to the bomb that destroyed UTA-772 and PanAm 103. Furthermore, neither a forensic inquiry by the Direction de la Surveillance du Territoire (DST) nor an examination by the scientific labortory of the Prefecture de police (PP) could make any connection between the timer-fragment and the bomb. Judge Bruguiere had therfore taken at face value the word of an FBI political operative Thomas Thurmann, who had been discredited in 1997 by the US Inspector-General, Michael Bromwich, and told never again to appear in court as an expert witness, rather than accept the findings of French forensic experts. It was revealed at the PanAm Flight 103 bombing trial that the British scientist, Dr. Thomas Hayes, had also failed to test the MEBO MST-13 timer-fragment for explosives residue. Such reckless disregard for the integrity of forensic evidence is likely to have the most profound effects upon the Scottish judicial process in relation to the Libyan Official Megrahi`s second appeal against conviction. FBI-agent Thurman was in symbiosis with its fellow-members of the CIA simultaneously working as a forensic expert on the attacks on PanAM-103 and UTA-772. 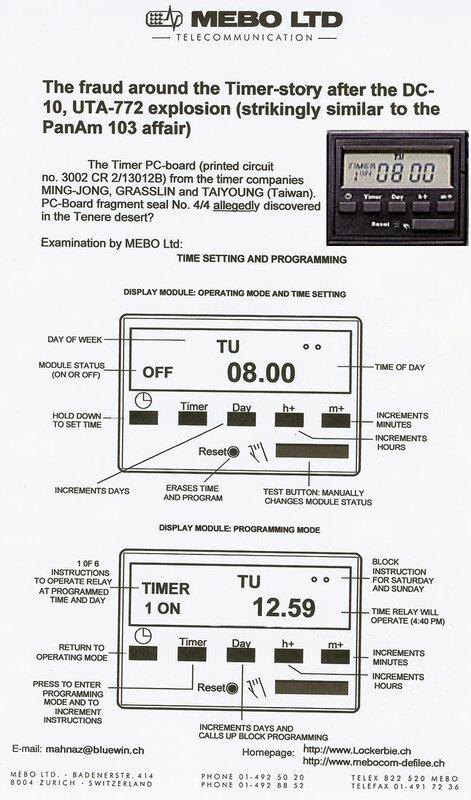 His labarotory was in possession of complete original MST-13 and TY timers – and this before the allegedly found timer fragments of a MST-13 and TY timer in Lockerbie and Teneree. He was told that for the two attacks eventually such timers could have been used. As told he later on fabricated knowingly the forensic evidence for these two possibilities. Thomas Thurman was for good reasons never summoned as a witness, neither in the "Lockerbie case" nor in the "UTA 772-case". In his 1997 reports on the "Lockerbie case" and on the "UTA 772 case" US Inspector General, Michael Bromwich, criticized Thurman for altering laboratory reports in such a way that rendered subsequent prosecution pointless. Following this criticism, Thurman was assigned to duties outside the FBI lab and, as a result, was not to be called in any trial as an expert witness. After leaving the FBI, Thurman joined the faculty at the School of Criminal Justice, Eastern Kentucky University. Also found was a tiny fragment of a green-coloured printed circuit board which, as in the case of Pan Am Flight 103, turned out to have been from a timing device. This fragment was identified by the FBI's Thomas Thurman as being manufactured by the Taiwanese firm "TY", which had supplied a number of such devices to Libya. In the late 1980s and for most of the 1990s, James Thomas Thurman was employed at the FBI forensics laboratory, which investigated explosives-related crimes. In written reports or giving evidence in court, Thurman would describe himself as an explosives forensic expert although it eventually transpired that he had no formal scientific qualifications. He left the FBI lab in 1997. The TY-Timer-fragment (seal no. 4/4) is a piece of doublesided printed circuit CP 3002R, color green, maximum size 15mm x 10mm. One of the sides shows a logo "TY" inscribed in a oval and next to it the letters "OIV". On the other side, one can see two parallel tracks drawing a double curve. The fragment was from an original TY-timer but one can not see if it has been modified or not. The exact dates under crypto ENCODE. This very small timer-fragment did not carry any traces of explosives, all the same it attracted the attention of F.B.I. 's special agent Thomas Thurman, who was allowed to assist the French experts, because the allegedly found TY-timer-fragment had similar distortions as the one allegedly picked up at the aera of the PanAm-103 Crash in Lockerbie (D11869). The written protocol of FBI agent Thomas Thurman can only be read under crypto ENCODE. Immediately after the discovery of this fragment, the FBI launched an investigation concerning the supplier of this fragment and the result was communicated to the French magistrate, who decided to carry out new investigations. The general director of Tai Youn was questionned and stated that the company COSTA had ordered several thousands of circuit boards of that PC-board type on behalf of the German company GRASSLIN. (D11624/82, D11888). The German company GRASSLIN Far East Corporation was COSTA's biggest customer at that time. GRASSLIN Far East has records of all its exports, also those to the USA. GRASSLIN German's sales in 1989 included some to H.P. Marketing, an occasional client that purchased only 101 TY-Timers. These 101 TY-Timers were delivered to H.P. Marketing on February 23, 1989 (1 Timer) and June 26, 1989 (100 Timers). At that time a former general in the Syrian army Mr. xxxxx (crypto ENCODED Counterman) from the company xxxxx (crypto ENCODED), headquartered in Damascus/Syria, did business with specialized military and security equippement. He contacted Mr. Hans Peter Wuest, director of H.P. Marketing, and made arrangements for business relations with the Libyan Military procurement departement (a high ranking military Official, Mr. xxxxx (crypto ENCODED). The contacts took place exclusively in the military camp on Rue de l'Aeroport at Tripolis. Before H.P. Marketing received an order of 100 TY-timers from the Libyan Military, Hanspeter Wuest travelled to Libya in February 1989 to test a single (1) TY-timer sample, technically slightly modified. In 1989 H.P. Marketing purchased a total of 101 TY-timers from a company called Kremser, which were manufactured by GRASSLIN (D12282/5). On July 26, 1989 H.P. Marketimg delivered 100 technically modified TY-timers to the Libyan Military departement, spezialized in landmine removal. Mr. Wuest stated that his customer, Mr. xxxxx (crypto ENCODED), did not indicate any spezific delivery date. The timer modules had to be waterproofed and insensitive to moisture. The customer had no preference with regard to the size or weight of these timers because it was unimportant for their final application. The first prototype Timer sample was different from the following 100 timers delivered to Libya. The first prototype PC-board originated from a GIS a51. (GIS = German Industrial standards). The additionally 100 delivered PC-boards originated from a different standard and the TY-Timer was fixed with a thin silicone adhesive to the green printed PC board. H.P. Marketing stated having sent two of the prototype PC-boards to the German judicial authorities who were responding to an international request from the US authorities, urged by Thomas Thurman's FBI Laboratory. In April 2007, D.C. District Judge Henry H. Kennedy found Libya directly responsible for the bombing based on extensive evidence from a French criminal case and presided over a three day bench trial from 13th to 15th August 2007. On 15th January 2008 Judge Kennedy issued an order awarding US$ 6 billion in damages to the families of the seven US victims (44 close family members) and the owners of the airliner. Because Kennedy accepted the plaint for compensation of Crowell & Moring (lawers of the victims) questionessly, no investigation took place. The court only decided on the amount of compensation – the enormous sum of 6 billions US$ plus interest for the american descendants of the victims and the owners of the aircraft. Why this ridiculous judgement will have no stand before the appeal judge on the 25th of February 2008 can only be read under crypto ENCODE and is at present time not available for public eyes. Libya and its four Officials, judged wrongly by a French Court, have provably nothing to do with the UTA-772 tragedy. who were wrongly jugded by a French Court and have provably nothing to do with the UTA-772 tragedy. As in the Lockerbie case the trial was held in the Netherlands under Scottish jurisdiction the same procedure could be applied in the UTA-772 tragedy, specially nowadays in the friendly climate between France and Libya. The expected release of Abdelbasset El Megrahi in the Lockerbie appeal will support also Libya's and its Official's innocence in the UTA-772 case. Therefore it is important that the Scottish High Court at the next procedural hearing in Edinburgh on the 20th of February 2008 finally admits the truth.